The famous Christian writer and preacher AW Tozer died on this day in 1963. He was an icon of 20th century Christian thought, whose reflections, particularly in his landmark work The Pursuit of God, continue to challenge and inspire today. 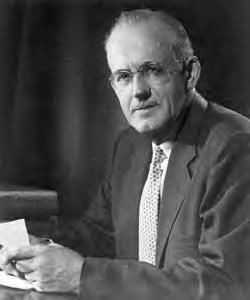 Tozer was a humble man with no formal theological training and despite the fame he won he eschewed the trappings of wealth and success. Living a simple life, he and his wife never even owned a car. Tozer’s thought largely centred on the idea of the ‘presence of God’- something deeply profound and transformative, but also something ignored in most churches he saw. Many were prioritising head knowledge about God – getting their doctrine right – over an actual living relationship with God. Tozer’s writings still offer a pastoral yet provocative word to the Church today. Here are 14 Tozer quotes that capture his insight into a deep spiritual life. 1. Refuse to be average. Let your heart soar as high as it will. 2. What comes into our minds when we think about God is the most important thing about us. 3. To be right with God has often meant to be in trouble with men. 4. The devil is a better theologian than any of us and is a devil still. 5. You can see God from anywhere if your mind is set to love and obey him. 6. The reason why many are still troubled, still seeking, still making little forward progress is because they haven’t yet come to the end of themselves. We’re still trying to give orders, and interfering with God’s work within us. 7. I want the presence of God himself, or I don’t want anything at all to do with religion… I want all that God has or I don’t want any. 9. When you kill time, remember that it has no resurrection. 10. What we think about when we are free to think about what we will – that is what we are or will soon become. 11. We can afford to follow him to failure. Faith dares to fail. The resurrection and the judgment will demonstrate before all worlds who won and who lost. We can wait. 12. Christians don’t tell lies, they just go to church and sing them. 13. Let us practise the fine art of making every work a priestly ministration. Let us believe that God is in all our simple deeds and learn to find him there. 14. Your poor heart, in which God put appreciation for everlastingness, will not take electronic gadgets in lieu of eternal life. Something inside of you is too big for that, too terrible, too wonderful. God has set everlastingness in your heart. All the things of this world are here for but a moment and then are gone.